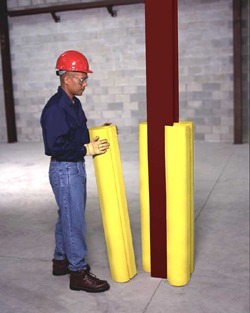 Ultra-I-Beam Protectors – Protect I-Beams From Forklift, Pallet Jacks, and Other Equipment. Dimensions: 7 1/2″ x 8 1/2″ x 36″Weight: 13 lbs. Modular Design – Use one Protector for each flange of I-beam. Allows installation on beams obstructed by walls or other structures. Four Protector units completely cover I-beam.